The Participatory City is a new book, edited by Yasminah Beebeejaun , which came out in March and will be launched on the 1st June. The book gather 19 chapters that explore the concept of participation in cities of all shapes and sizes. As Yasminah notes, concern about participation has started in the 1960s and never gone from urban studies – be it in anthropology, geography, urban planning, history or sociology. The book is structured around short chapters of about eight pages, with colour images that illustrate the topic of the chapter. This make the book very accessible – and suitable for reading while commuting in a city. The chapters take you for a tour around many places in the world: from London, Berlin, Bangalore, to Johannesburg, Mexico City and to small towns in Pennsylvania and Lancashire (and few other places). It also explores multiple scales – from participation in global negotiations about urban policy in the UN, to the way immigrants negotiate a small area in central Dublin, as well as discussion of master-planning in several places, including London and Mexico City. The book demonstrate the multi-faceted aspects of participation: from political power, to gender, environmental justice, indigenous rights, skills, expertise and the use of scientific information for decision making. Each of the chapters provides a concrete example for the participatory issue that it covers, and by so doing, make the concept that is being addressed easy to understand. Not surprisingly, many of the success stories in the book’s chapters are minor, temporary and contingent on a set of conditions that allow them to happen. Together, the chapters demonstrate that participation, and the demand for representation and rights to the city are not futile effort but that it is possible to change things. With a price tag that is reasonable, though not cheap (€28, about £21), this is highly recommended book that charts the aspects of urban participation in the early part of the 21st century, and especially demonstrating the challenges for meaningful participation in the face of technological developments, social and economic inequalities, and governance approaches that emphasise markets over other values. Haklay, M., 2016, Making Participatory Sensing Meaningful, in Beebeejaun, Y. (Ed.) The Participatory City, Jovis, pp. 154-161. These are the slides from my talk at the Algorithmic Governance workshop (for which there are lengthy notes in the previous post). The workshop explored the many ethical, legal and conceptual issues with the transition to Big Data and algorithm based decision-making. My contribution to the discussion is based on previous thoughts on environmental information and public use of it. Inherently, I see the relationships between environmental decision-making, information, and information systems as something that need to be examined through the prism of the long history that linked them. This way we can make sense of the current trends. This three area are deeply linked throughout the history of the modern environmental movement since the 1960s (hence the Apollo 8 earth image at the beginning), and the Christmas message from the team with the reference to Genesis (see below) helped in making the message stronger . To demonstrate the way this triplet evolved, I’m using texts from official documents – Stockholm 1972 declaration, Rio 1992 Agenda 21, etc. They are fairly consistent in their belief in the power of information systems in solving environmental challenges. The core aspects of environmental technophilia are summarised in slide 10. This leads to environmental democracy principles (slide 11) and the assumptions behind them (slide 12). While information is open, it doesn’t mean that it’s useful or accessible to members of the public. This was true when raw air monitoring observations were released as open data in 1997 (before anyone knew the term), and although we have better tools (e.g. Google Earth) there are consistent challenges in making information meaningful – what do you do with Environment Agency DSM if you don’t know what it is or how to use a GIS? How do you interpret Global Forest Watch analysis about change in tree cover in your area if you are not used to interpreting remote sensing data (a big data analysis and algorithmic governance example)? I therefore return to the hierarchy of technical knowledge and ability to use information (in slide 20) that I covered in the ‘Neogeography and the delusion of democratisation‘ and look at how the opportunities and barriers changed over the years in slide 21. ‘The past decade has seen an explosion in big data analytics and the use of algorithm-based systems to assist, supplement, or replace human decision-making. This is true in private industry and in public governance. It includes, for example, the use of algorithms in healthcare policy and treatment, in identifying potential tax cheats, and in stopping terrorist plotters. Such systems are attractive in light of the increasing complexity and interconnectedness of society; the general ubiquity and efficiency of ‘smart’ technology, sometimes known as the ‘Internet of Things’; and the cutbacks to government services post-2008. This trend towards algorithmic governance poses a number of unique challenges to effective and legitimate public-bureaucratic decision-making. Although many are already concerned about the threat to privacy, there is more at stake in the rise of algorithmic governance than this right alone. Algorithms are step-by-step computer coded instructions for taking some input (e.g. tax return/financial data), processing it, and converting it into an output (e.g. recommendation for audit). When algorithms are used to supplement or replace public decision-making, political values and policies have to be translated into computer code. The coders and designers are given a set of instructions (a project ‘spec’) to guide them in this process, but such project specs are often vague and underspecified. Programmers exercise considerable autonomy when translating these requirements into code. The difficulty is that most programmers are unaware of the values and biases that can feed into this process and fail to consider how those values and biases can manifest themselves in practice, invisibly undermining fundamental rights. This is compounded by the fact that ethics and law are not part of the training of most programmers. Indeed, many view the technology as a value-neutral tool. They consequently ignore the ethical ‘gap’ between policy and code. This workshop will bring together an interdisciplinary group of scholars and experts to address the ethical gap between policy and code. The workshop was structured around 3 sessions of short presentations of about 12 minutes, with an immediate discussion, and then a workshop to develop research ideas emerging from the sessions. This very long post are my notes from the meeting. These are my takes, not necessarily those of the presenters. For another summery of the day, check John Danaher’s blog post. Professor Willie Golden (NUI Galway) ‘Algorithmic governance: Old or New Problem?’ focused on an information science perspective. We need to consider the history – an RO Mason paper from 1971 already questioned the balance between the decision-making that should be done by humans, and that part that need to be done by the system. The issue is the level of assumptions that are being integrated into the information system. Today the amount of data that is being collected and the assumption on what it does in the world is a growing one, but we need to remain sceptical at the value of the actionable information. Algorithms needs managers too. Davenport in HBR 2013 pointed that the questions by decision makers before and after the processing are critical to effective use of data analysis systems. In addition, people are very concerned about data – we’re complicit in handing over a lot of data as consumers and the Internet of Things (IoT) will reveal much more. Debra Estrin 2014 at CACM provided a viewpoint – small data, where n = me where she highlighted the importance of health information that the monitoring of personal information can provide baseline on you. However, this information can be handed over to health insurance companies and the question is what control you have over it. Another aspect is Artificial Intelligence – Turing in 1950’s brought the famous ‘Turing test’ to test for AI. In the past 3-4 years, it became much more visible. The difference is that AI learn, which bring the question how you can monitor a thing that learn and change over time get better. AI doesn’t have self-awareness as Davenport 2015 noted in Just How Smart are Smart Machines and arguments that machine can be more accurate than humans in analysing images. We may need to be more proactive than we used to be. Death of Governance?’ focused on digital curation/data sustainability and implication for governance. We invest in data curation as a socio-technical practice, but need to explore what it does and how effective are current practices. What are the implications if we don’t do ‘data labour’ to maintain it, to avoid ‘data tumbleweed. We are selecting data sets and preserving them for the short and long term. There is an assumption that ‘data is there’ and that it doesn’t need special attention. Choices that people make to preserve data sets will influence the patterns of what appear later and directions of research. Downstream, there are all sort of business arrangement to make data available and the preserving of data – the decisions shape disciplines and discourses around it – for example, preserving census data influenced many of the social sciences and direct them towards certain types of questions. Data archives influenced the social science disciplines – e.g. using large data set and dismissing ethnographic and quantitative data. The governance of data institutions need to get into and how that influence that information that is stored and share. What is the role of curating data when data become open is another question. Example for the complexity is provided in a study of a system for ‘match making’ of refugees to mentors which is used by an NGO, when the system is from 2006, and the update of job classification is from 2011, but the organisation that use the system cannot afford updating and there is impacts on those who are influenced by the system. Professor John Morison (QUB), ‘Algorithmic Governmentality’. From law perspective, there is an issue of techno-optimism. He is interested in e-participation and participation in government. There are issue of open and big data, where we are given a vision of open and accountable government and growth in democratisation – e.g. social media revolution, or opening government through data. We see fantasy of abundance, and there are also new feedback loops – technological solutionism to problems in politics with technical fixes. Simplistic solutions to complex issues. For example, an expectation that in research into cybersecurity, there are expectations of creating code as a scholarly output. Big Data have different creators (from Google to national security bodies) and they don’t have the same goals. There is also issues of technological authoritarianism as a tool of control. Algorithmic governance require to engage in epistemology, ontology or governance. We need to consider the impact of democracy – the AI approach is arguing for the democratisation through N=all argument. Leaving aside the ability to ingest all the data, what is seemed to assume that subjects are not viewed any more as individuals but as aggregate that can be manipulated and act upon. Algorithmic governance, there is a false emancipation by promise of inclusiveness, but instead it is responding to predictions that are created from data analysis. The analysis is arguing to be scientific way to respond to social needs. Ideas of individual agency disappear. Here we can use Foucault analysis of power to understand agency. Finally we also see government without politics – arguing that we make subjects and objects amenable to action. There is not selfness, but just a group prediction. This transcend and obviates many aspects of citizenship. Niall O’Brolchain (Insight Centre), ‘The Open Government’. There is difference between government and governance. The eGov unit in Galway Insight Centre of Data Analytics act as an Open Data Institute node and part of the Open Government Partnership. OGP involve 66 countries, to promote transparency, empower citizens, fight corruption, harness new technologies to strengthen governance. Started in 2011 and involved now 1500 people, with ministerial level involvement. The OGP got set of principles, with eligibility criteria that involve civic society and government in equal terms – the aim is to provide information so it increase civic participation, requires the highest standards of professional integrity throughout administration, and there is a need to increase access to new technologies for openness and accountability. Generally consider that technology benefits outweigh the disadvantages for citizenship. Grand challenges – improving public services, increasing public integrity, public resources, safer communities, corporate accountability. Not surprisingly, corporate accountability is one of the weakest. Using the Foucault framework, the question is about the potential for resistance that is created because of the power increase. There are cases to discuss about hacktivism and use of technologies. There is an issue of the ability of resisting power – e.g. passing details between companies based on prediction. The issue is not about who use the data and how they control it. Sometime need to use approaches that are being used by illegal actors to hide their tracks to resist it. A challenge to the workshop is that the area is so wide, and we need to focus on specific aspects – e.g. use of systems in governments, and while technology is changing. Interoperability. There are overlaps between environmental democracy and open data, with many similar actors – and with much more government buy-in from government and officials. There was also technological change that make it easier for government (e.g. Mexico releasing environmental data under OGP). Sovereignty is also an issue – with loss of it to technology and corporations over the last years, and indeed the corporate accountability is noted in the OGP framework as one that need more attention. There is also an issue about information that is not allowed to exists, absences and silences are important. There are issues of consent – the network effects prevent options of consent, and therefore society and academics can force businesses to behave socially in a specific way. Keeping of information and attributing it to individuals is the crux of the matter and where governance should come in. You have to communicate over the internet about who you are, but that doesn’t mean that we can’t dictate to corporations what they are allowed to do and how to use it. We can also consider of privacy by design. Dr Brendan Flynn (NUI Galway), ‘When Big Data Meets Artificial Intelligence will Governance by Algorithm be More or Less Likely to Go to War?’. When looking at autonomous weapons we can learn about general algorithmic governance. Algorithmic decision support systems have a role to play in very narrow scope – to do what the stock market do – identifying very dangerous response quickly and stop them. In terms of politics – many things will continue. One thing that come from military systems is that there are always ‘human in the loop’ – that is sometime the problem. There will be HCI issues with making decisions quickly based on algorithms and things can go very wrong. There are false positive cases as the example of the USS Vincennes that uses DSS to make a decision on shooting down a passenger plane. The decision taking is limited by the decision shaping, which is handed more and more to algorithms. There are issues with the way military practices understand command responsibility in the Navy, which put very high standard from responsibility of failure. There is need to see how to interpret information from black boxes on false positives and false negatives. We can use this extreme example to learn about civic cases. Need to have high standards for officials. If we do visit some version of command responsibility to those who are using algorithms in governance, it is possible to put responsibility not on the user of the algorithm and not only on the creators of the code. Negatives’. We all know that algorithmic interrogation of data for crime prevention is becoming commonplace and also in companies. We know that decisions can be about life and death. When considering surveillance, there are many issues. Consider the probability of assuming someone to be potential terrorist or extremist. In Human Rights we can use the concept of private life, and algorithmic processing can challenge that. Article 8 of the Human Right Convention is not absolute, and can be changed in specific cases – and the ECHR ask for justifications from governments, to show that they follow the guidelines. Surveillance regulations need to explicitly identify types of people and crimes that are open to observations. You can’t say that everyone is open to surveillance. When there are specific keywords that can be judged, but what about AI and machine learning, where the creator can’t know what will come out? There is also need to show proportionality to prevent social harm. False positives in algorithms – because terrorism are so rare, there is a lot of risk to have a bad impact on the prevention of terrorism or crime. The assumption of more data is better data, we left with a problem of generalised surveillance that is seen as highly problematic. Interestingly the ECHR do see a lot of potential in technologies and their potential use by technologies. Professor Dag Weise Schartum (University of Oslo), ‘Transformation of Law into Algorithm’. His focus was on how algorithms are created, and thinking about this within government systems. They are the bedrock of our welfare systems – which is the way they appear in law. Algorithms are a form of decision-making: general decisions about what should be regarded, and then making decisions. The translation of decisions to computer code, but the raw material is legal decision-making process and transform them to algorithms. Programmers do have autonomy when translating requirements into code – the Norwegian experience show close work with experts to implement the code. You can think of an ideal transformation model of a system to algorithms, that exist within a domain – service or authority of a government, and done for the purpose of addressing decision-making. The process is qualification of legal sources, and interpretations that are done in natural language, which then turn into specification of rules, and then it turns into a formal language which are then used for programming and modelling it. There are iterations throughout the process, and the system is being tested, go through a process of confirming the specification and then it get into use. It’s too complex to test every aspect of it, but once the specifications are confirmed, it is used for decision-making. In terms of research we need to understand the transformation process in different agency – overall organisation, model of system development, competences, and degree of law-making effects. The challenge is the need to reform of the system: adapting to changes in the political and social change over the time. Need to make the system flexible in the design to allow openness and not rigidness. from Social Media Contributions’ philosophy and psychological background. Algorithms can access different sources – blogs, social media and this personal data are being used to analyse mood analysis, and that can lead to observations about mental health. In 2013, there are examples of identifying of affective disorders, and the research doesn’t consider the ethical implication. Data that is being used in content, individual metadata like time of online activities, length of contributions, typing speed. Also checking network characteristics and biosensing such as voice, facial expressions. Some ethical challenges include: contextual integrity (Nissenbaum 2004/2009) privacy expectations are context specific and not as constant rules. Secondly, lack of vulnerability protection – analysis of mental health breach the rights of people to protect their health. Third, potential negative consequences, with impacts on employment, insurance, etc. Finally, the irrelevance of consent – some studies included consent in the development, but what about applying it in the world. We see no informed consent, no opt-out, no content related vulnerability protections, no duty of care and risk mitigation, there is no feedback and the number of participants number is unlimited. All these are in contrast to practices in Human Subjects Research guidelines. In terms of surveillance, we should think about self-surveillance in which the citizens are providing the details of surveillance yourself. Surveillance is not only negative – but modern approach are not only for negative reasons. There is hoarding mentality of the military-industrial complex. The area of command responsibility received attention, with discussion of liability and different ways in which courts are treating military versus civilian responsibility. Evidence in Legal Fact Finding’. The discussion about legal aspects can easily go to 1066 – you can go through a whole history. There are many links to medieval law to today. As a regulatory tool, there is the issue with the rule of proof. Legal scholars don’t focus enough on the importance of evidence and how to understand it. Regulations of technology is not about the law but about the implementation on the ground, for example in the case of data protection legislations. In a recent NESTA meeting, there was a discussion about the implications of Big Data – using personal data is not the only issue. For example, citizen science project that show low exposure to emission, and therefore deciding that it’s relevant to use the location in which the citizens monitored their area as the perfect location for a polluting activity – so harming the person who collected data. This is not a case of data protection strictly. How can citizen can object to ‘computer say no’ syndrome? What are the minimum criteria to challenge such a decision? What are the procedural rules of fairness. Have a meaningful cross examination during such cases is difficult in such cases. Courts sometimes accept and happy to use computer models, and other times reluctant to take them. There are issues about the burden of proof from systems (e.g. to show that ATM was working correctly when a fraud was done). DNA tests are relying on computer modelling, but systems that are proprietary and closed. Many algorithms are hidden for business confidentiality and there are explorations of these issues. One approach is to rely on open source tools. Replication is another way of ensuring the results. Escrow ownership of model by third party is another option. Next, there is a possibility to questioning software, in natural language. Dr Aisling de Paor (DCU), ‘Algorithmic Governance and Genetic Information’ – there is an issue in law, and massive applications in genetic information. There is rapid technological advancement in many settings, genetic testing, pharma and many other aspects – indications of behavioural traits, disability, and more. There are competing rights and interests. There are rapid advances in this area – use in health care, and the technology become cheaper (already below $1000). Genetic information. In commercial settings use in insurance, valuable for economic and efficiency in medical settings. There is also focus on personalised medicine. A lot of the concerns are about misuse of algorithms. For example, the predictive assumption about impact on behaviour and health. The current state of predictability is limited, especially the environmental impacts on expressions of genes. There is conflicting rights – efficiency and economic benefits but challenge against human rights – e.g. right to privacy . Also right for non-discrimination – making decisions on the basis of probability may be deemed as discriminatory. There are wider societal and public policy concerns – possible creation of genetic underclass and the potential of exacerbate societal stigma about disability, disease and difference. Need to identify gaps between low, policy and code, decide use, commercial interests and the potential abuses. Anthony Behan (IBM but at a personal capacity), ‘Ad Tech, Big Data and Prediction Markets: The Value of Probability’. Thinking about advertising, it is very useful use case to consider what happen in such governance processes. What happen in 200 milliseconds for advertising, which is the standards on the internet. The process of real-time-bid is becoming standardised. Start from a click – the publisher invokes an API and give information about the interactions from the user based on their cookie and there are various IDs. Supply Side Platform open an auction. on the demand side, there are advertisers that want to push content to people – age group, demographic, day, time and objectives such as click through rates. The Demand Side platform looks at the SSPs. Each SSP is connected to hundreds of Demand Side Platforms (DSPs). Complex relationships exist between these systems. There are probability score or engage in a way that they want to engage, and they offer how much it is worth for them – all in micropayment. The data management platform (DMP) is important to improve the bidding. e.g., if they can get information about users/platform/context at specific times places etc is important to guess how people tend to behave. The economy of the internet on advert is based on this structure. We get abstractions of intent – the more privacy was invaded and understand personality and intent, the less they were interested in a specific person but more in the probability and the aggregate. Viewing people as current identity and current intent, and it’s all about mathematics – there are huge amount of transactions, and the inventory become more valuable. The interactions become more diverse with the Internet of Things. The Internet become a ‘data farm’ – we started with a concept that people are valuable, to view that data is valuable and how we can extract it from people. Advertising goes into the whole commerce element. I’ll blog about my talk ‘Algorithmic Governance in Environmental Information (or How Technophilia Shapes Environmental Democracy)’ later. There are issues with genetics and eugenics. Eugenics fell out of favour because of science issues, and the new genetics is claiming much more predictive power. In neuroscience there are issues about brain scans, which are not handled which are based on insufficient scientific evidence. There is an issue with discrimination – shouldn’t assume that it’s only negative. Need to think about unjustified discrimination. There are different semantic to the word. There are issues with institutional information infrastructure. The Eye on Earth Summit, which was held in Abu Dhabi last week, allowed me to immerse myself in the topics that I’ve been researching for a long time: geographic information, public access to environmental information, participation, citizen science, and the role of all these in policy making. My notes (day 1 morning, day 1 afternoon, day 2 morning, day 2 afternoon, day 3 morning & day 3 afternoon) provide the background for this post, as well as the blog posts from Elisabeth Tyson (day 1, day 2) and the IISD reports and bulletins from the summit. The first Eye on Earth Summit provided me with plenty to think about, so I thought that it is worth reflecting on my ‘Take home’ messages. What follows are my personal reflections from the summit and the themes that I feel are emerging in the area of environmental information today. When considering the recent ratification of the Sustainable Development Goals or SDGs by the UN Assembly, it is not surprising that they loomed large over the summit – as drivers for environmental information demand for the next 15 years, as focal points for the effort of coordination of information collection and dissemination, but also as an opportunity to make new links between environment and health, or promoting environmental democracy (access to information, participation in decision making, and access to justice). It seems that the SDGs are very much in the front of the mind of the international organisations who are part of the Eye on Earth alliance, although other organisations, companies and researchers who are coming with more technical focus (e.g. Big Data or Remote Sensing) are less aware of them – at least in terms of referring to them in their presentations during the summit. 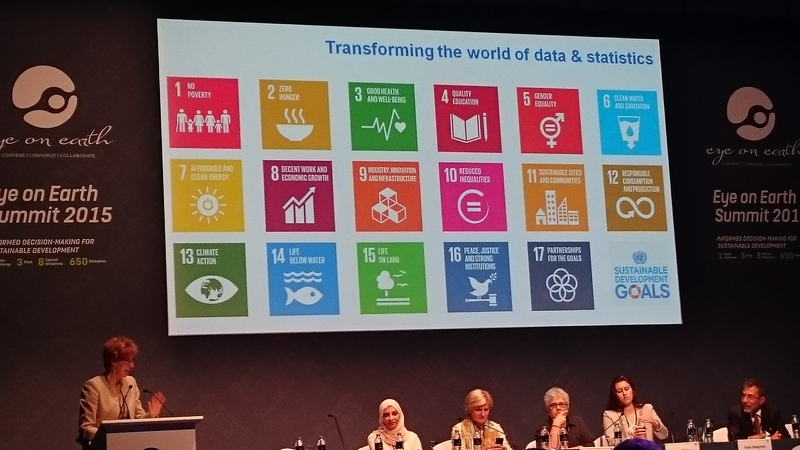 Beyond the SDGs, two overarching tensions emerged throughout the presentations and discussions – and both are challenging. They are the tensions between abundance and scarcity, and between emotions and rationality. Let’s look at them in turn. Abundance and scarcity came up again and agin. On the data side, the themes of ‘data revolution’, more satellite information, crowdsourcing from many thousands of weather observers and the creation of more sources of information (e.g. Environmental Democracy Index) are all examples for abundance in the amount of available data and information. At the same time, this was contrasted with the scarcity in the real world (e.g species extinction, health of mangroves), scarcity of actionable knowledge, and scarcity with ecologists with computing skills. Some speakers oscillated between these two ends within few slides or even in the same one. There wasn’t an easy resolution for this tension, and both ends were presented as challenges. With emotions and scientific rationality, the story was different. Here the conference was packed with examples that we’re (finally!) moving away from a simplistic ‘information deficit model‘ that emphasise scientific rationality as the main way to lead a change in policy or public understanding of environmental change. 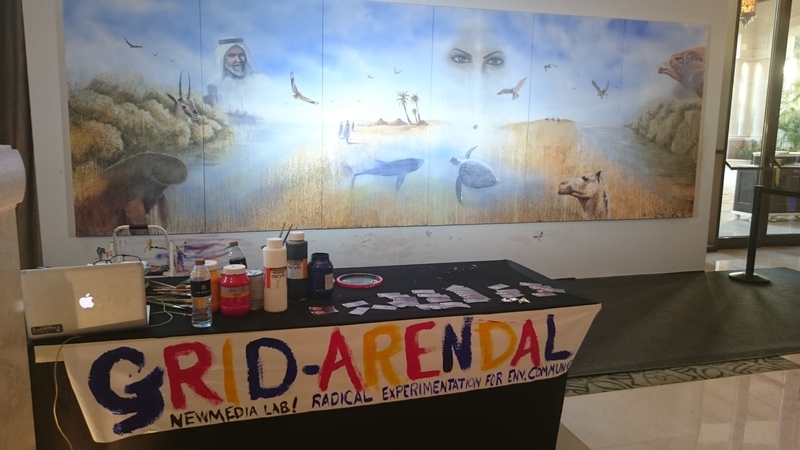 Throughout the summit presenters emphasised the role of mass media communication, art (including live painting development through the summit by GRID-Arendal team), music, visualisation, and story telling as vital ingredients that make information and knowledge relevant and actionable. Instead of a ‘Two Cultures’ position, Eye on Earth offered a much more harmonious and collaborative linkage between these two ways of thinking and feeling. Next, and linked to the issue of abundance and scarcity are costs and funding. Many talks demonstrated the value of open data and the need to provide open, free and accessible information if we want to see environmental information used effectively. Moreover, providing the information with the ability of analyse or visualise it over the web was offered as a way to make it more powerful. However, the systems are costly, and although the assessment of the IUCN demonstrated that the investment in environmental datasets is modest compared to other sources (and the same is true for citizen science), there are no sustainable, consistent and appropriate funding mechanisms, yet. Funding infrastructure or networking activities is also challenging, as funders accept the value, but are not willing to fund them in a sustainable way. More generally, there is an issue about the need to fund ecological and environmental studies – it seem that while ‘established science’ is busy with ‘Big Science’ – satellites, Big Data, complex computer modelling – the work of studying ecosystems in an holistic way is left to small group of dedicated researchers and to volunteers. The urgency ad speed of environmental change demand better funding for these areas and activities. However, there was ambivalence about it – should it be seen as an instrument, a tool to produce environmental information or as a mean to get wider awareness and engagement by informed citizens? How best to achieve the multiple goals of citizen science: raising awareness, educating, providing skills well beyond the specific topic of the project, and democratising decision making and participation? It seem to still be the case that the integration of citizen science into day to day operations is challenging for many of the international organisations that are involved in the Eye on Earth alliance. Another area of challenging interactions emerged from the need for wide partnerships between governments, international organisations, Non-Governmental Organisations (NGOs), companies, start-ups, and even ad-hoc crowds that respond to a specific event or an issue which are afforded by digital and social network. There are very different speeds in implementation and delivery between these bodies, and in some cases there are chasms that need to be explored – for example, an undercurrent from some technology startups is that governments are irrelevant and in some forms of thinking that ‘to move fast and break things’ – including existing social contracts and practices – is OK. It was somewhat surprising to hear speakers praising Uber or AirBnB, especially when they came from people who familiar with the need for careful negotiations that take into account wider goals and objectives. I can see the wish to move things faster – but to what risks to we bring by breaking things? With the discussions about Rio Principle 10 and the new developments in Latin America, the Environmental Democracy Index, and the rest, I became more convinced, as I’ve noted in 2011, that we need to start thinking about adding another right to the three that are included in it (access to environmental information, participation in decision-making, and access to justice), and develop a right to produce environmental information that will be taken seriously by the authorities – in other words, a right for citizen science. I was somewhat surprised by the responses when I raised this point during the discussion on Principle 10. Finally, Eye on Earth was inclusive and collaborative, and it was a pleasure to see how open people were to discuss issues and explore new connections, points of view or new ways of thinking about issues. A special point that raised several positive responses was the gender representation in such high level international conference with a fairly technical focus (see the image of the closing panel). The composition of the speakers in the summit, and the fact that it was possible to have such level of women representation was fantastic to experience (making one of the male-only panels on the last day odd!). It is also an important lesson for many academic conferences – if Eye on Earth can, I cannot see a reason why it is not possible elsewhere.